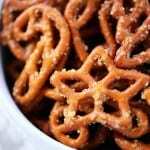 Christmas Crack Pretzels are no bake ranch pretzels with an irresistibly crunchy, salty, buttery taste. 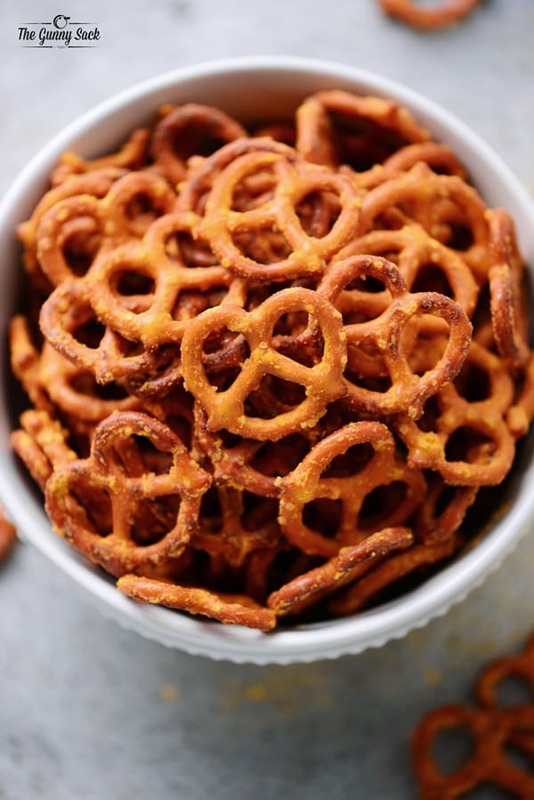 These seasoned pretzels are the perfect snack! I was shopping at a local grocery store and had the opportunity to visit with some lovely people while shopping. An elderly woman was reaching for a bag of Christmas pretzels at the same time as me and we struck up a conversation. I was buying the pretzels to make Peanut Butter Cup Pretzels and she was buying them to make ranch pretzels. She told me that she makes them every Christmas and they are so amazing that you can’t stop eating them. She went on to explain how to make the pretzels. The woman told me to mix butter flavored popcorn oil, powdered ranch (she said to make SURE to use the salad dressing mix NOT the dip mix), garlic powder and dill weed. You pour it over the pretzels (she noted that the bag of pretzels doesn’t have thirty ounces so she adds some pretzel sticks to the mix) and stir them every fifteen minutes for a few hours until the oil is absorbed. That’s it, no baking needed! She told me that she had already made one batch this year and was planning to make more. Well, after her description and our delightful chat, I had to try making the pretzels. I’m not sure where she got the recipe, so I decided to make a few changes to make it mine, just in case. When I searched for ranch pretzels online, I discovered that these ranch pretzels are referred to as Crack Pretzels because of how addicting they are! To make the seasoning for the Christmas Crack Pretzels, whisk together Orville Redenbacher’s Butter Flavored Popcorn Oil, Hidden Valley Ranch powdered salad dressing mix, garlic powder, and cajun seasoning. Pour the seasoning oil over the pretzels and stirred to coat. Then, sprinkle the pretzels with grated Parmesan and stir well. Allow the pretzels to absorb the oil for about three hours, stirring every fifteen minutes. 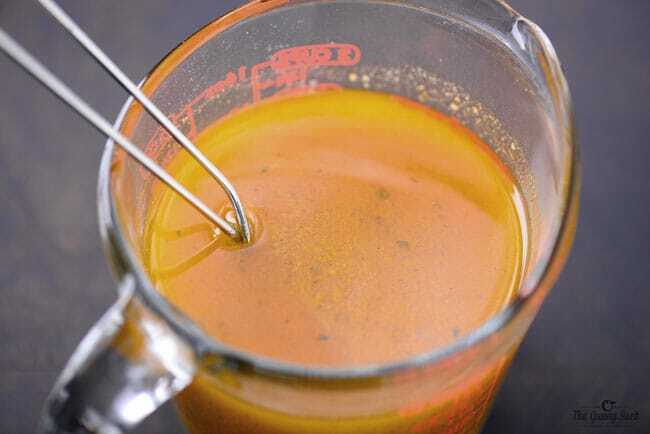 You don’t turn the oven on, just stir occasionally until the oil is absorbed! These Christmas Crack Pretzels were gobbled up by everyone we shared with. The crunchy, salty, buttery combination is fabulous! 1. Will other kinds of pretzels work? 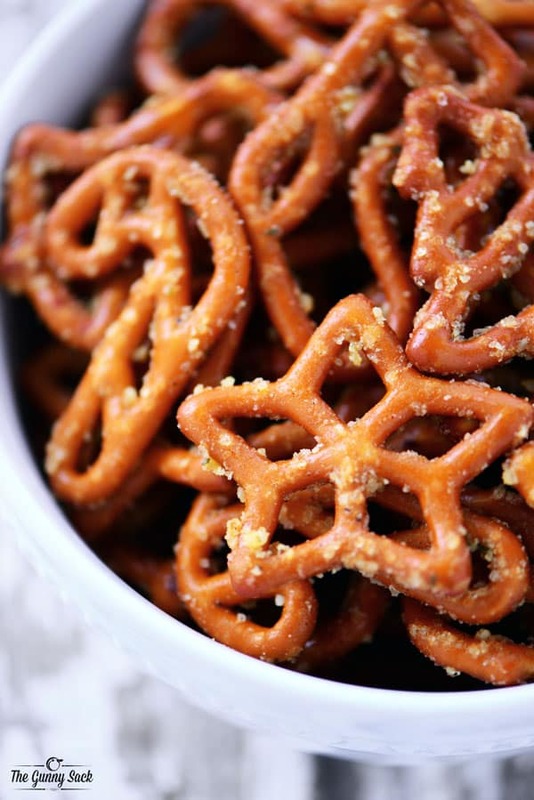 Any shape or style of pretzels can be used from twists to spirals and sticks to squares. Use the football shaped ones during football season. The mini twists for Valentine’s Day and the circles for Easter. 2. What other seasonings can be added? Lots of readers left great suggestions for additional seasonings! Here are a few of them: lemon pepper, lemon crystals, dill weed, Old Bay, paprika, chili powder, cayenne pepper, celery salt, seasoned salt, and creole seasoning. 3. How can this be turned into a snack mix? Great idea! I love snack mixes. 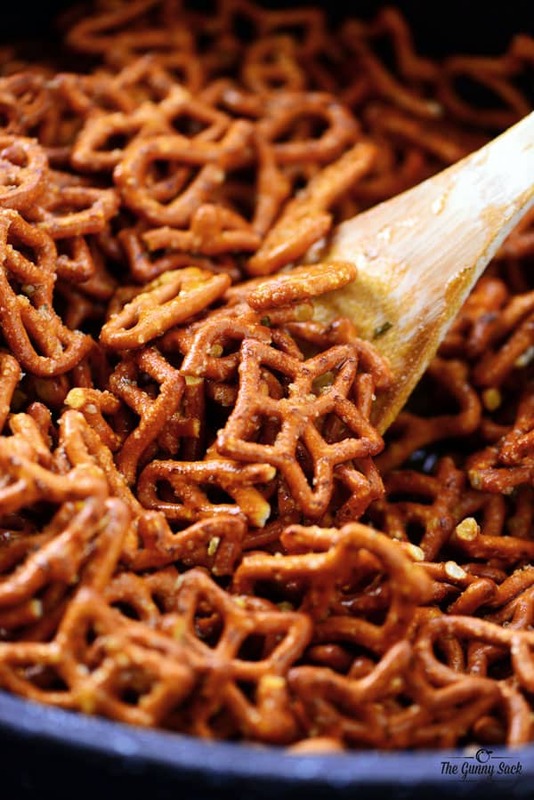 To turn these crack pretzels into crack snack mix, use fewer pretzels and add other snack items instead. Try any combination of pretzels with Cheez-Its, oyster crackers, Chex cereal, Goldfish, Bugels, cashews, peanuts, oyster crackers, Cheerios, or Fritos. 4. Do you have a substitute for the butter flavored popcorn oil? You can try canola oil or melted butter. This is a NO BAKE recipe! You just stir until the oil is absorbed! Put the pretzels into a roasting pan. Whisk together the oil, powdered ranch, garlic powder, and cajun seasoning. Pour the mixture over the pretzels in the roasting pan and stir to coat. Sprinkle with grated parmesan and stir to coat. The bag of pretzels I purchased contained 24 ounces of pretzels, so as the woman from the grocery store suggested, I added a few of handfuls of pretzels from another bag. All recipes similar to this say to use the ranch dressing mix, not the dip mix. why? What’s the difference? I accidentally bought the dip mix 😓 can I still make this? Will it still turn out? While I’ve never tried using the dip mix, I think it would work just fine. The package of dressing mix also includes buttermilk so that flavor might be a little different when using the dip mix but still delicious! Let us know how it turns out if you do try it! These sound good; but also extremely salty. Is that correct? I don’t mind some salt; but this looks like a lot!! The parmesan cheese, ranch seasoning and cajun seasoning all contain a lot of salt. ??? I use epicure spices which don’t have the salt in and they are pure. I used ranch, curry, lemon dill, the different options are amazing especially if using epicure. I made this as written and they were crazy salty. I don’t say this lightly, because I always use quite a bit of salt in my cooking. I expected these to be salty as a snack food, but it was too much even for me. I am going to make them again but will back off of the ranch dressing mix a bit to see how that works. A really interesting addition I’ve had to this recipe was lemon crystals! Sounds weird, but it gives it such an interesting, delicious, keep-you-coming-back-for-more flavor! I suppose that would make it similar to the slightly different Spicy Pretzels my mom likes to make. It has lemon pepper in it. I have made the ranch pretzels for several years now. When I make the ranch pretzels, I use about 12oz of canola oil instead of the popcorn oil, worked great! I also used 2-one pound bags of pretzels. All the other ingredients were the same with the same amounts. 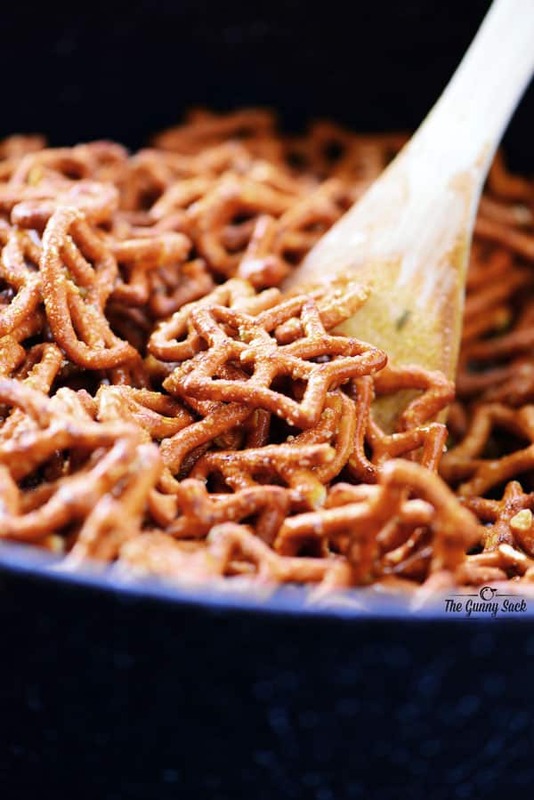 I am going to make these Cajun Crack Pretzels, the recipe sounds awesome! In an air tight container, I have had them last for several weeks, but usually they are long gone before then!! I’ve never tested that. Usually, once a bag of pretzels is open they only last about a week before getting stale so that’s probably what I would go by in my house. Ah, but since these are “crack” pretzels, I imagine they wouldn’t last a week to get stale? Can I freeze these? Also the Pretzels seem to have some oil on them, not all the oil is absorbed in. I am still tossing them in the bag, I made them this morning (14 hours ago). I will see how they are in the morning. Do you have any hint on getting rid of to much oil? I’ve never tried freezing pretzels but I’ve heard of others doing so to extend the life of them. If the oil is still an issue this morning, try dumping the pretzels onto a paper towel lined baking sheet to let them dry a bit. The paper towels will help absorb some of the oil but hopefully not too much of the seasoning. I’d turn the oven on low, the same as I do my Chex mix and it should absorb without a problem, I’m going to look at my Chex mix recipe to check on the amount of oil I use in it. I freeze them for at least 24 hours then take out of the freezer and lay in single layer to dry. I have never seen the Christmas shaped pretzels before! Too cute. I’ll be doing a google search for sure so I can make this! Made these for a football playoff party and used the waffle pretzels. Turned out awesome! My mother-in-law used to make these with oyster crackers every year at Christmas, and now it’s up to me to carry on the tradition. This is an old Hidden Valley Ranch Company recipe. They are so yummy and addicting! Combine all and pour over crackers, stir to coat. Place in pre-heated 300° oven for 15-20 minutes, stirring once. Thanks for this recipe! I made these for Christmas day to serve during the football game. Everyone loved them! I also took them to a Boxing Day gathering yesterday and they also received rave reviews. The only change I made was that I used Old Bay seasoning as opposed to Cajun as I didn’t have Cajun and didn’t feel like buying it either. Worked perfectly! Is there any reason not to just use melted butter instead of butter flavored oil? And has anyone tried it with Italian salad dressing mix instead of ranch? Are these best served right away or can they be made a few days in advance? Thanks! Can you use something else in place of the buttered oil? I made a party mix using 1 bag oyster crackers, 1 box plain Cheez its, and pretzels. I bought a 13 ounce movie theater butter oil, used 4 tsp of ranch, and 1 tsp garlic powder, 1 tsp creole seasoning, and heated mixture for 1 min before pouring over snack mix. Followed the mix every so often instructions, and it turned out great! I’m loving the sound of that combination! I am going to try it for my family! I’ve made something similar with soup crackers ( the little round ones) using ranch, dill, garlic, and oil. This recipe sounds just as good and I can’t wait to try it! I’ve had soup crackers like that before and I love them! I make 20 pounds of this every year for my husbands employees and my clients. A couple of helpful tips. Heat the oil for one minute in the microwave before pouring over pretzels. Mix in a plastic container with a lid and just shake and flip several times. Let set overnight so there is no excess oil….not the healthiest treat but it’s yummy. Can you tell me what the oven temperature should be? Could these be done in a crock pot? I’ve never tried it but I think they would work it you left the cover off of the crockpot. If you do try it, let us know how it turned out! I have some oil that wasn’t absorbed. Do I just scoop the pretzels out or should I drain on paper towel? These are delicious. 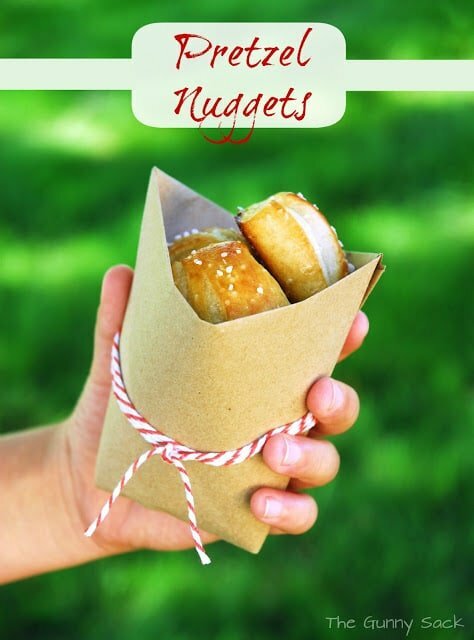 I would just scoop the pretzels out and place them in a container or ziptop bag. Thanks Tonia! I recently bought a cracker seasoning in a gift shop that called for making seasoned crackers in a similar method and I have been trying to recreate it, this will be very close. Using the buttered flavored oil is brilliant! I got a recipe from a random grocery conversation today too, that I’m going to add to our holiday menu…I’m going to start talking more at the grocery store!! Happy Holidays! Sounds fantastic! What are Amish pretzels and where can I find them? Amish pretzels are the thick, braided pretzels. Make sure you get the salted ones. I get mine in my local ShopRite grocery store – they have them under their label. Snyder’s brand also has them. I’ve never noticed them but will definitely look for them next time! Thanks!